Karam has joined MBM in 2010 and since then had various roles with the firm. 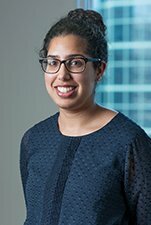 Karam recently joined MBM’s finance team in May of 2016 as a Client Finance Specialist. Her responsibilities include working with MBM's professionals and paralegals to process clients' monthly billings. Prior to joining MBM, Karam studied Human Kinetics at the University of Ottawa. in her spare time, her passions include fitness, books (autobiographies, action/adventure and fantasy) and lots and lots of hockey!